A team of scientists discovered a star called S0-102 that orbits the black hole at the center of our Milky Way galaxy in 11.5 years. This is the shortest known orbit of any star near this black hole and with future measurements it may provide scientists with the opportunity to test Einstein’s theory of general relativity. Stars S0-2 (lighter circle) and S0-102 (in red) orbit the enormous black hole at the center of our galaxy in less time than it takes for a human to be eligible for a California driver’s license. In this image, the Keck II Telescope is on the left and the Keck I Telescope is on the right. Each telescope has an adaptive optics systems that uses a laser to correct the distorting effects of the Earth’s atmosphere in real time. 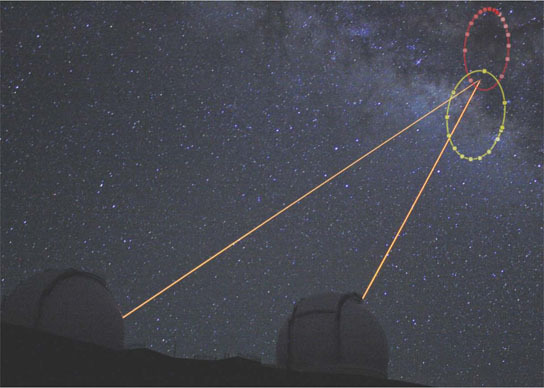 The lasers are pointing to the center of the Milky Way. Background photo credit: Dan Birchall/Subaru Telescope on Mauna Kea, Hawaii. Overlay created by Professor Andrea Ghez and her research team at UCLA and are from data sets obtained with the W. M. Keck Telescopes. 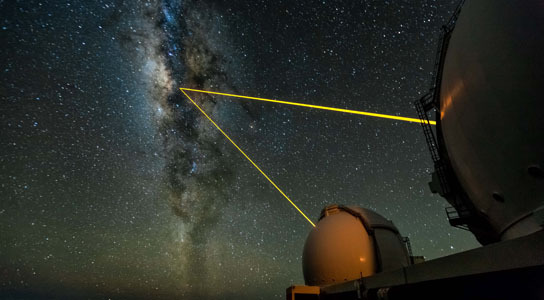 1 Comment on "Astronomers Discover Star Orbiting the Black Hole at Center of the Milky Way"
How far are these stars from the black hole and what are their linear orbitling speeds?